Which lady shave will comfortably rid you of unwanted body hair, leaving you feeling smooth and confident? We tested lady shavers across different price points from well known brands, all of which we’d recommend. Our absolute favourite? The Philips SatinShave Prestige. Before we get started it needs to be pointed out that lady shavers are very different from men’s shavers, which are designed to cut small areas of coarse hair. Lady shavers are designed specifically less coarse hairs over a large surface. 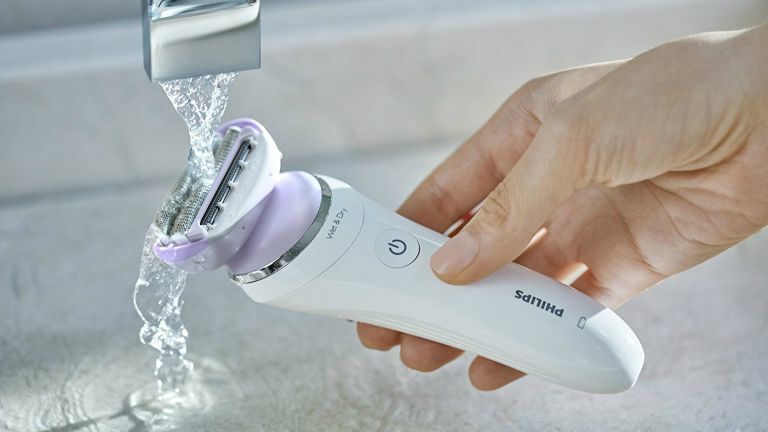 Some lady shavers are designed only to be used on dry skin, while others are designed to be used on either dry or wet skin (when you shower or take a bath). If you’re graduating from disposable razors to a lady shaver, you’ll be used to shaving whilst you bathe, so do take that into consideration when choosing the best lady shaver for you. That said it’s ultra convenient to be able to dry shave too – you’ll be surprised how much you use the your shaver dry! Good wet/dry shavers shouldn’t dictate your shaving/shower gel but you do need to be aware of particularly thick products that can clog shavers. For our testing we’ve used ordinary shower gel, as we normally would in the shower. These days all decent shavers are cordless and just require plugging in to charge (unless of course they are exclusively battery operated in the case of our Boots Lady shaver). Charges vary from sleek stands that’ll make sure your tech takes pride of place to run of the mill plugs and leads. Of course you should be lead by performance and features but it pays to consider aesthetics too – who wants ugly tech in their life? Not only is the Philips SatinShave Prestige a cool, funky looking shaver but it is well designed and handles very well too. We were impressed with the multiflex head, as it stayed close to the body while feeling comfortable on dry skin and when wet in the shower. It didn’t miss hairs, so there was no need to redo the same area, making the whole experience very quick. The skin stretcher cap (included) helps with this precision. The included bikini trimmer head and cap also work excellently and are quick to change too – there’s absolutely no need to have a bikini trimmer if you own this shaver. It only takes 5 minutes for an hour of charge. The travel cap and pouch prove very useful whilst travelling. Our only criticism – we wish the charger was a stand type rather than plug and lead. Looks wise, the Remington Smooth & Silky Cordless Ladyshaver certainly isn’t ugly – it’s just not beautiful. It feels well built, and handles well with its ergonomic design. The two floating foils gave an excellent close shave and it followed our body contours very well, when used on dry skin and in the shower. The included bikini trimmer comb is very useful as it means you don’t need to pay out for an intimate area trimmer too. This shaver is cordless and comes with a matching stand which recharges the battery and impressively has a charge life of just 30 minutes! It comes with a cleaning brush and beauty bag, which is handy when travelling. The Braun Silk-épil 9 SkinSpa isn’t just a lady shaver - it’s also an ultra precise epilator and body massager! Whilst we won’t detail the epilation and massager experience we’ll just say we were very impressed with both – especially the epilation speed. The unit is well built, aesthetically pleasing and feels reassuringly sturdy in the hand. The shaving experience was great on dry skin -nice and close and a comfortable experience. We liked the on/off dial and thumb pad, were reassured by the shaver lock catch and loved the smartlight, which made even short, light hairs easy to spot! Unfortunately however, with the shaver head attached it’s only recommended to be used dry. The 12 attachments include a bikini trimmer. A great all-round hair removal devise but not worth the cash if you just wanted a dry shaver. With such a tiny price tag we weren’t quite sure what to expect from the Boots Lady Shaver. We were however pleasantly surprised. The basic design is inoffensive and comfortable to grip. It’s super simple with just one large on/off switch on the front, so you’re up and running immediately. It features a detachable head for ease of cleaning (a cleaning brush is included too), which again is super simple and works well. It’s quite loud as you shave but does the job perfectly, both wet and dry. Not that we’d expect it at this price but there are no extras like a bikini trimmer comb, so we just did our legs. Its battery operated only, so will cost you in batteries if you use it a lot. In our opinion – fab for occasional use, between waxes or holidays.